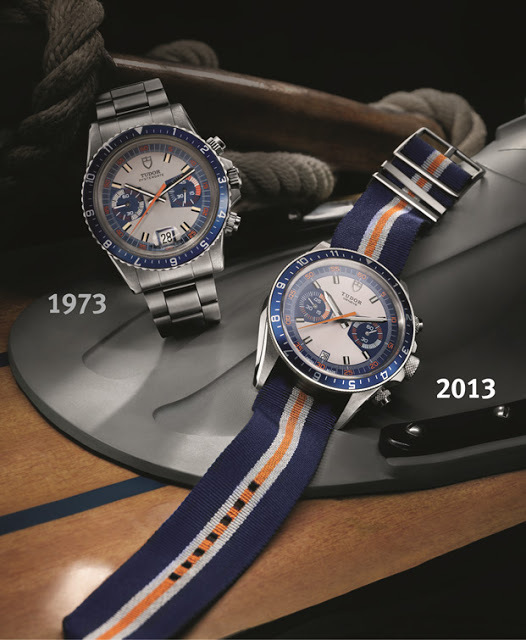 Tudor has just announced its second vintage style chronograph, the Heritage Chrono Blue (ref. 70330B). 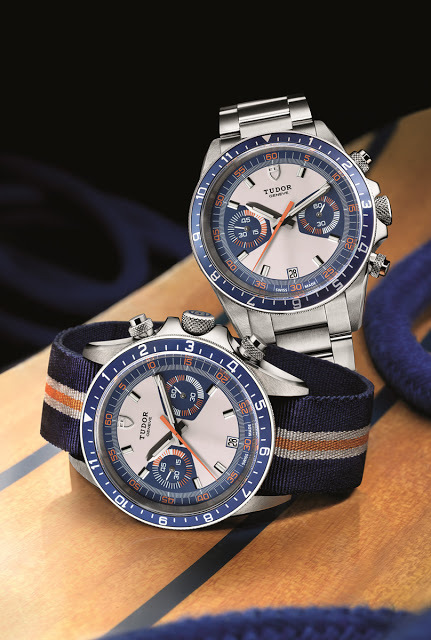 In blue, orange and grey, the new Tudor Heritage Chrono Blue is modelled after the 1973 Tudor “Monte Carlo” chronograph. 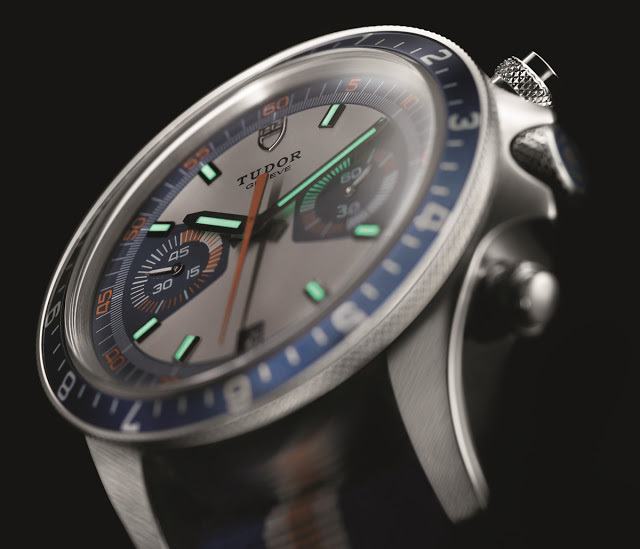 The first Tudor Heritage Chronograph launched in 2010 was a huge hit, and it began Tudor’s winning streak with vintage reissues, like last year’s Black Bay diver. This year sees the Heritage Chronograph return in another guise. 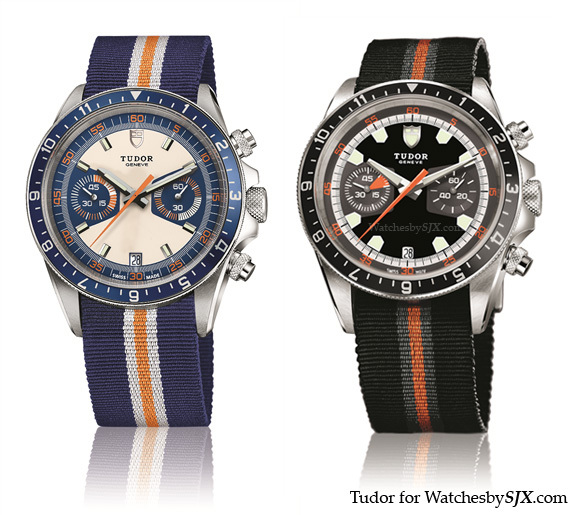 Like the other Tudor Heritage reissues, the Heritage Chrono Blue is not an exact remake of its vintage predecessor (pictured below left), but it is close enough. 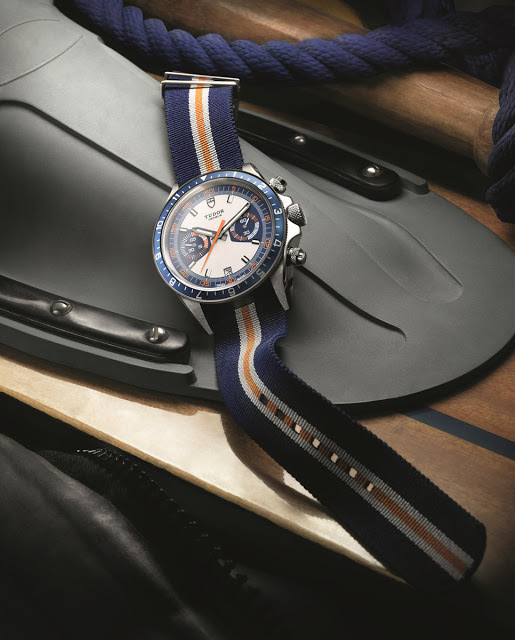 Based on the “Monte Carlo” chronograph of 1973 with its distinctive blue, orange and grey dial, the Heritage Chrono Blue shares the same 42 mm steel case and bidirectional rotating bezel as the black and orange Heritage Chronograph. Though the dial looks similar at first glance, the Heritage Chrono Blue is its own watch. The hands, indices and minute track are the most obvious differences; the new Heritage Blue Chrono has bevelled, applied markers filled with SuperLuminova. I daresay the Chrono Blue looks better and more original than the earlier Heritage Chronograph. Inside is the same ETA 2892 based chronograph movement as before. 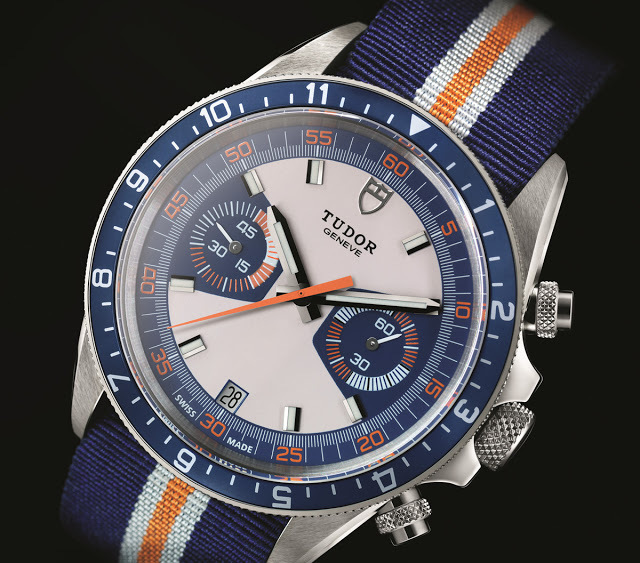 And the other Tudor Heritage models, the Heritage Chrono Blue is supplied with two strap options: in this case a steel bracelet and a canvas strap.